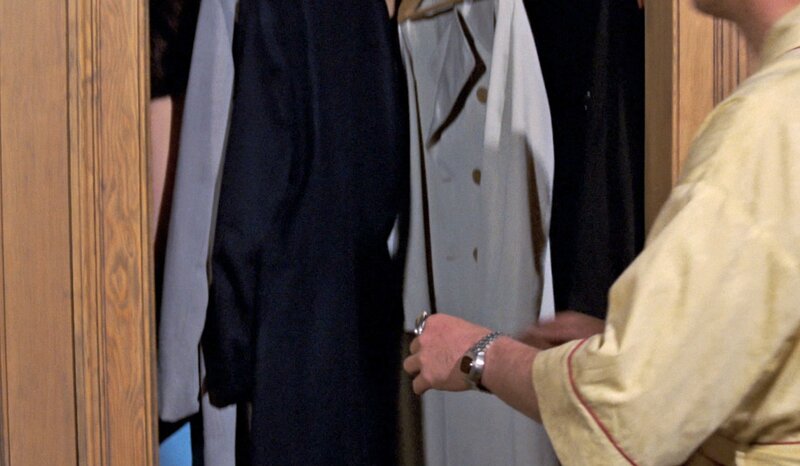 James Bond’s coat closet is filled with a coat or jacket for every occasion. I am speaking of Bond’s coat closet metaphorically because his true coat closet in Live and Let Die is not filled with all of the coats a modern man may need. 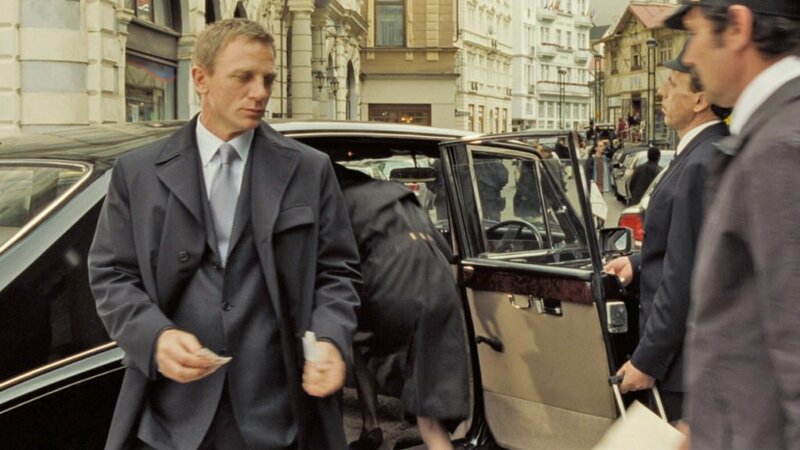 Since we follow Bond on no fewer than 24 missions, we see many of the coats he brings with him for these missions as well as around town in London. Though Bond has new outerwear in every film, the following seven items are essential for Bond’s world travels. The Crombie coat is a dressy three-quarter-length—a length that is mid-thigh to above the knee—coat with a fly front in a medium to heavy weight and is appropriate to wear over suits and sports coats. In a lighter weight this style would be known as a topcoat, but Bond more often wears heavier weights for better protection against the elements. Navy is Bond’s favourite coat colour, and it is one of the most versatile colours for an overcoat because it pairs well with shades of grey, blue, brown and tan. Bond wears many navy coats throughout the series, but the herringbone Crombie-style coat in Spectre with its moleskin collar is one of the most interesting and one of the most versatile. Bond’s is in a wool, silk and mohair blend, but pure wool melton is just as functional and comfortable. A full-length coat—knee-length or longer—may currently be unfashionable, but there’s no denying that longer coats are warmer. This kind of coat is best made of cashmere for a luxurious warm feel, but it can be made of wool melton to be more utilitarian. A full-length coat is the ultimate for warmth and the ultimate in elegance to wear over a suit or dinner suit. A long coat can be navy, charcoal or black. Navy works well with suits, sports coats and midnight blue dinner suits; charcoal works with much of the same plus black dinner suits; black works well with dinner suits and grey suits and trousers but is least versatile. A double-breasted coats adds extra material with a large overlap on the front to keep in the warmth. Though Bond generally prefers navy-coloured coats after his time in the Royal Navy, he occasionally wears coats in other colours. 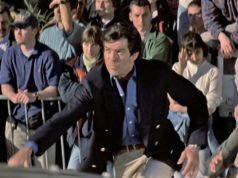 Another navy coat after the Crombie coat, such as the guards coat from Die Another Day or the double-breasted chesterfield from Live and Let Die, serves as a versatile cold-weather coat, and the double-breasted style is a Bond staple. When it rains, James Bond needs to wear something over his suit to keep it dry. Because it does not rain often in the James Bond films, we only occasionally see James Bond with a raincoat. Both the Bond of Fleming’s novels and Daniel Craig in Casino Royale wear a single-breasted raincoat in heavy navy blue cotton. 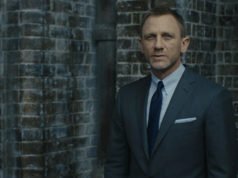 It shouldn’t come as a surprise that Bond likes his raincoats in blue as well, and dark blue has a more modern look than the traditional tan raincoat or trenchcoat. For cold weather, a good raincoat may have a button-in warmer made of wool or a synthetic blend to transform the rain coat into an additional cold-weather coat. A warmer can turn a raincoat into a snowcoat! Without a warmer, a raincoat is comfortable in more moderate temperatures. For cold-weather casual wear, the pea coat is a modern Bond favourite. The pea coat (also called a “peacoat”, “p coat”, “pea jacket” or “pilot jacket”) is a hip-length, straight-cut, double-breasted military coat of wool, traditionally in navy or black. Naturally, Bond prefers the navy version. With the collar popped for extra protection from the wind, the pea coat should be made of wool that is heavy enough to prevent wind and cold penetration. Because this is a coat for cold weather, it should be large enough to wear with layers underneath, and it pairs well over a wool or cashmere jumper. Because the pea coat is a short coat, it should not be worn over a suit or jacket. For sportswear in the coldest locations such as Iceland and Siberia, Bond needs something colder than a pea coat. 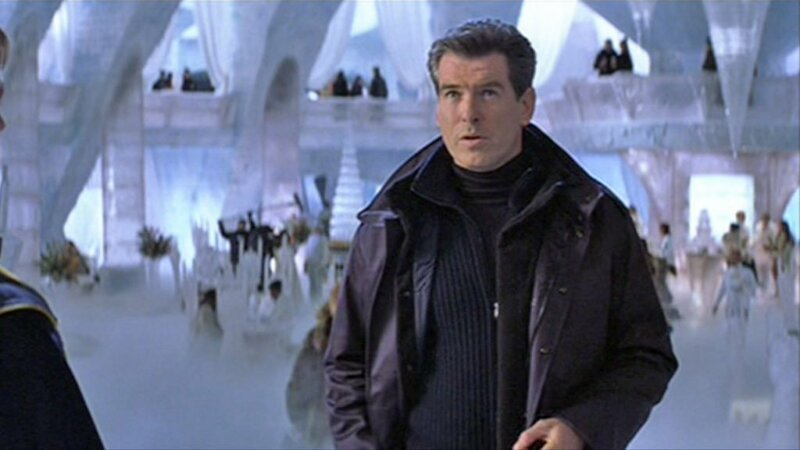 A down-filled hooded parka is necessary for Bond to survive on his coldest missions. With the recent popularity of the Canada Goose coats, the parka is now a fashionable garment. Bond usually wears parkas for skiing, but a parka is equally useful for just sneaking around in frigid weather and snow. The parka is for sportswear and casual wear rather than for suits and sports coats, but when the temperature is too cold for a woollen overcoat, only a parka will do. When Bond needs a casual jacket for moderately cool or warm weather, he turns to the classic Harrington jacket. 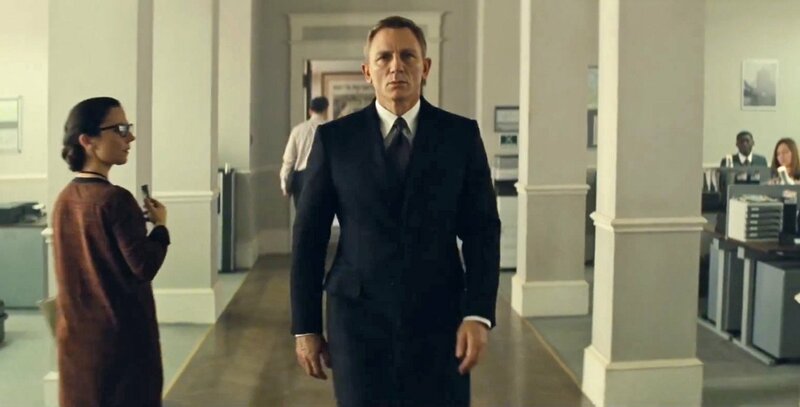 Bond wears a jacket frequently in warm weather because he needs a way to conceal his Walther PPK. Even for people who do not need to conceal a weapon, the pockets in a casual jacket can be useful. The Harrington is great to wear over a polo or sports shirt. 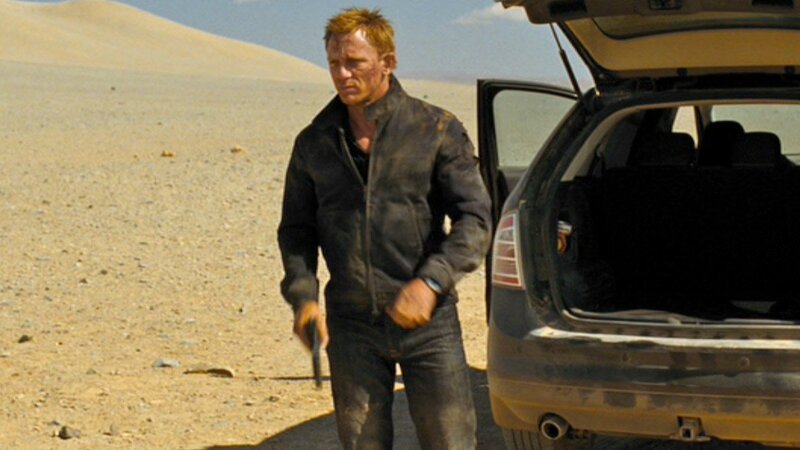 Daniel Craig’s navy Harrington jacket in the desert in Quantum of Solace is a stylish look for combat, or for just a weekend jaunt around town. Jackets in leather and suede are useful for casual wear in a wide range of temperatures. Starting with Roger Moore’s suede blouson in For Your Eyes Only, leather jackets in various styles have been amongst Bond’s favourites for dressing down. Like the Harrington, leather and suede jackets work well over sports shirts and polos, but heavier leather jackets can be worn over a jumper in colder weather. 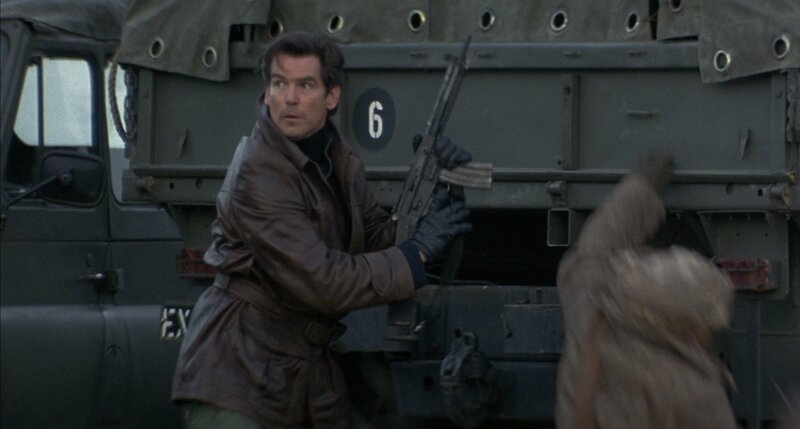 Bond wears suede jackets in tan, blue, grey and green, and he wears leather jackets in the brown and black. Any chance on finding out who made the parka? An impressing is that wether you like James Bond or not this still is the perfect wardrobe for the modern gentleman. Depending on your job and financial resources you may find some pieces superfluous (for example you can choose between the Crombie and the DB overcoat if you just need one dressy coat, etc), but still, it’s perfect for every season and every activity. Maybe too many navy blue in the closet, but it’s a safe choice, contrary to black. Good point, though navy works well with pretty much anything and it seems to be literary Bond’s favourite colour. Arguably, the tan polo overcoat is an even more versatile garment due to the colour and style. It goes pretty well with all colours of suits and sportswear and even looks at home with a thick sweater instead of a jacket. The closest thing we’ve seen Bond wearing to it was the vicuna double breasted overcoat in TND. I completely agree. In double breasted it looks great. But it definitely has style and is perfect for winter. The tan or bronze or camel color give it more presence than the conventional navy or grey. I still think a double breasted coat is more formal than a single breasted one though and thus would be less appropriate to wear with casual clothing (trousers with heavy jumper for example). Whenever I see one of Brosnan’s DB Brioni coats or Moore’s chesterfield I think could kill someone for it ! It goes especially well when the wearer is tall, I think. Gives a grand, majestic impression that you cannot have with a single breasted overcoat. I currently have the first four. I don’t really see the need for a parka since, even in Cleveland’s frigid winter weather, my dress coat is warm enough to stand up to anything. I will probably get a Harrington at some point, but for now my casual rain coat is a Top Man branded short mac. I have a leather jacket, but it’s a blazer modeled jacket, so it’s not really useful for anything but spring weather. 1. I have a Crombie branded crombie coat in 20 oz. light navy wool and cashmere Melton with peak lapels and a self collar. It’s warm enough to work as an intermediary coat. I still don’t wear it over jackets, but it works well enough for the office or nights out when I’m not wearing one and it’s not so cold that I need the full length coat. 2. I have a repurposed US Navy bridge coat in 36 oz. midnight wool and polyester Melton with an Ulster collar. This coat is below knee length, weighs close to 40 pounds, and is basically proof against anything. I replaced the brass buttons with gray horn for a more dressy appearance. The Ulster collar takes it down a notch in formality, but it’s a necessity given the high winds and lake effect snow that we get here. 3. I have a Ralph Lauren branded balmacaan in khaki cotton gaberdine. I’m looking to upgrade to a real trench coat in a shade of tan or blue, since the Prussian collar on the balmacaan doesn’t really offer much protection. 4. I have a Ralph Lauren branded pea coat in 20 oz. navy wool and nylon Melton. This is my casual winter coat. I’ve lost a significant amount of weight since I bought it so it’s now too long for me. I’m looking to replace it with either a higher quality peacoat, a shearling reefer coat in the same style, or a B-3 bomber jacket. Saul, I just bought a bridge coat like that. Unfortunately, it was mislabeled as the wrong size! Very warm and nice, however. I wish it worked out. It is. A nice feature, that you’ll find on most rain coats, but not all winter coats, is that the pockets have pass-throughs, so you can access your jacket or trouser hip pockets while the coat is buttoned. The half belt is functional too, so you can adjust the waist by six inches in or out from the standard position. I really liked the pass-through pockets on that as well. I kind of wish all my overcoats and raincoats had them. I was under the impression that a chesterfield should only be worn with blacktie. That is wrong. Chesterfields pair nicely with suits as well. Don’t you think that’s going into the dandy /Macnee/Avenger realm? Not at all. Roger Moore looks perfectly elegant in his Chesterfield and suit in Live and Let Die. While velvet collars are dandy on a suit, they are classic on an overcoat. I understand that particular piece but what is the coat was camel color and the chesterfield collar was in effect? I think you are misunderstanding the velvet collar. A velvet collar is not a “Chesterfield collar”, and velvet collars are used on a number of different kinds of coats. Chesterfield coats are formal because they are long and have a fly front or double-breasted front, and they do not need a velvet collar to define them a Chesterfield. The coat is unchanged in formality and purpose whether or not is has a velvet collar. The covert coat also traditionally has a fly front and velvet collar, but it is a three-quarter length and made of a lighter, sportier cloth. The covert coat is a less formal coat for suits and sports coats. If Bond wore a camel chesterfield with a velvet collar, that would be a less formal coat than a dark chesterfield, and it wouldn’t be much different than vicuna-coloured overcoat from Tomorrow Never Dies, which is also a Chesterfield. Thank you again sir. Very fine indeed! What exactly are the pass through pockets for ? Interesting review as usual from Matt; I strived to find a coat like the one Daniel Craig wears in the cut scene of spectre and finally managed to find it in a London store, it’s quite similar with its moleskin collar and dark blue herringbone material. Very comfortable but like almost everyone I’ve no Walter PPK to conceal. However the article doesn’t adress one of the most interesting Bond’s winter piece, the most harshly tested, I mean the one he wears in the final sequence of Skyfall on a London rooftop. 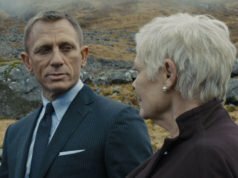 The coat from Skyfall (worn at the National Gallery as well as at the end of the film) fits in the same category as the Crombie coat, but it’s a less interesting style. Do you know anything about the overcoat Daniel Craig wore for some of the Casino Royale promotional images over his dinner suit? I assume it was Brioni based on the shoulders, but I can’t tell much else about it’s details in the photos I have seen. Interesting, have you a link for the pictures ? In the U.K. right now, without having a coat made, it seems to me to be all but impossible to find an overcoat, wool or cashmere, in a full length. The overwhelming majority, certainly everything that I’m aware of, is of a length above the knee. I love a full length overcoat but since that fashion ended, it’s an itch I haven’t since been able to scratch. Charity shops! And know a good cleaner and tailor ! I couldn’t agree more! I found a full-length 100% camel hair Hickey-Freeman overcoat in near-new condition for 20 dollars at my local Goodwill store – I just had to have it dry-cleaned and have the sleeves lenghthened a bit. I am increasingly convinced that vintage is the way to go unless one can afford bespoke. Crombie is still making a couple full length overcoats, but not for very long I suspect. In their defence, they’re known for their titular 3/4 length overcoat. I don’t have a price range. The right price for the right coat. I suppose I’m not ready to concede that I need a ‘portly’ cut (re the above)! I have a Crombie navy Melton overcoat, they make absolutely lovely coats. Really well made and classic. Just not long enough! They do a couple of longer coats – the King coat is long, but a bit flash. Then they do some military greatcoats, but it is cold enough to wear those for a week out of every year in the U.K.! I’d be interested to see your article. Those coats you mention from Crombie are beautiful, but definitely overkill for where I live. It only gets to the low 30s (Fahrenheit) middle of the day a couple times out of the year. I do want at least one full length, melton wool overcoat however, as I sometimes travel to my home country of Canada during the cold months. That must look so elegant, I wish I had that kind of luck. Thanks, Matt! For the raincoat, do you think a (navy) trenchcoat would be appropriate?